Latte art...no, I'm not kidding. If you were to look down into your morning's first cup of coffee and see the image above, what would you do? Probably you'd either go back to bloody marys for breakfast, or else fire your barrista (unless you were the flirty type). It's difficult to come up with a "new" type of art, but this one is relatively new, dating back only to the late 1980s or early 90s when the "designer" coffee craze began to sweep the U.S. The pioneers in this art form were Jack Kelly and his follower, David Schomer, both of Seattle, both of whom owned coffee shops. They began to play round with espresso topped with foamy milk to the delight of their customers and their cash registers. Inasmuch as espresso originated in Italy, it's likely early forms of what's come to be called "latte art" began there as well. Now however, over the past 25 years, this art form has spread around the world. The Dutch and the Japanese seem especially adept at breaking new...foam...in this regard. There are even international competitions each year. 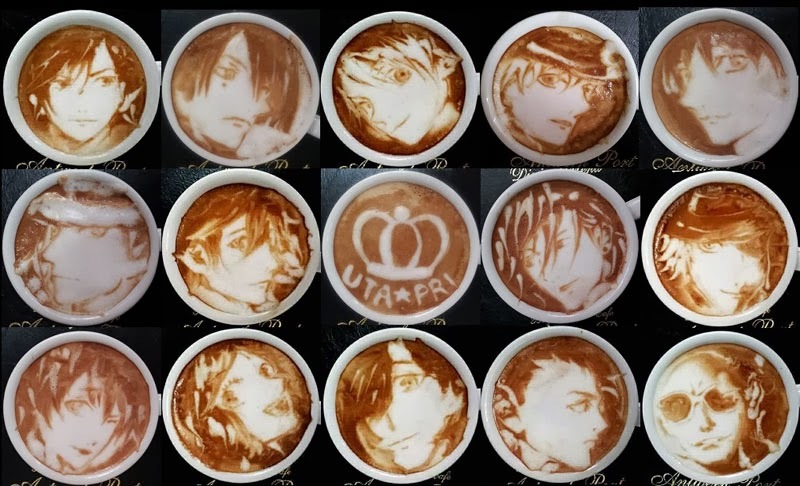 The award-winning Latte designs of Osaka artist, Kazuki Yamamoto. Just spiral outward, then dissect like cutting a pie. In the early years the designs were quick, easy, and simple--hearts, a few flowers, web-like creations, and the occasional butterfly. 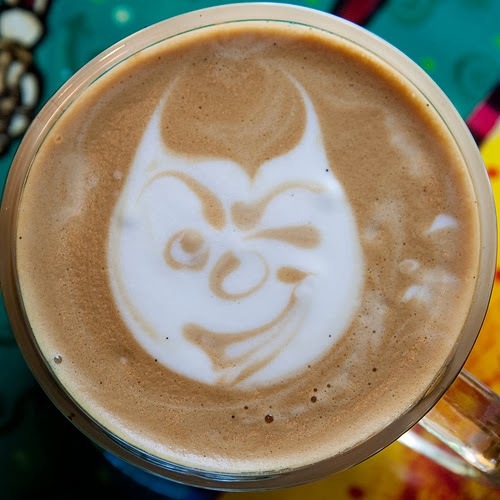 Today, however, you can get faces in your latte, messages, cutesy creatures and creepy critters all of which barely last five minutes before dissolving into your drink and being drunk. Latte artists also sometimes add chocolate syrup and miniature marshmallows for 3-D effects. 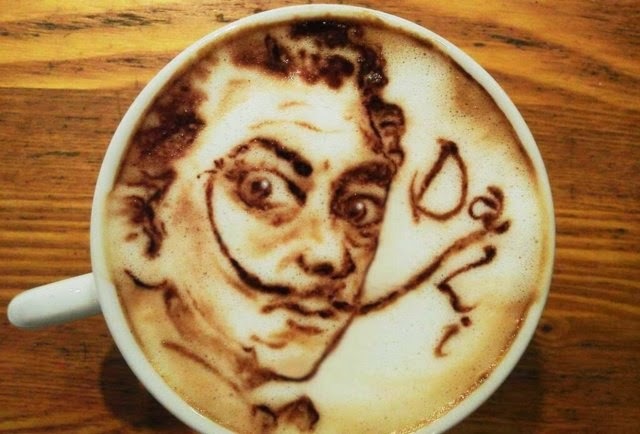 And if your barrista is good...I mean really good, you might get your own portrait floating around atop your drink. Or if you prefer, perhaps Harry Potter (below, right), Salvador Dali (below), Albert Einstein, or Mickey Mouse. For the arty, camera phones have captured the frothy, floating, foamy features of Leonardo's Mona Lisa and Edvard Munch's The Scream (below, left). Though little kids don't usually drink lattes (nor can they afford them) there is virtually no limit to the list of likely little lads and lasses from the comic pages to delight the kid in all of us. There are basically two methods in creating latte art--pouring and etching--usually a combination of both. 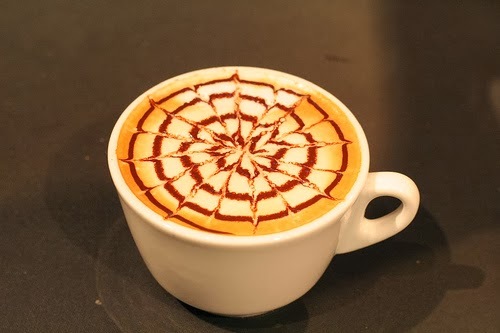 Pouring refers to the way the foamy milk is poured into the cup of espresso, while etching (usually with a wooden stick or toothpick) involves moving the milk around. It sounds tricky, but really it's not. Try it sometime. Virtually anyone can make an attractive design or a funny face. The tricky part, if you're a barrista, is moving beyond that, being able to replicate more fanciful designs quickly and consistently for your customers and for your tips. Latte art, though temporary, can be very rewarding. Designs vary in complexity from simply "cool" to...how the hell'd he do THAT?